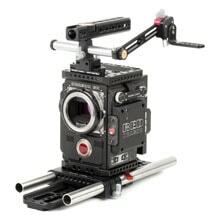 The RED Weapon/Epic-W/Scarlet-W/Raven Accessory Kit (Advanced) includes the Easy Riser which is a baseplate that has 1/4-20 and 3/8-16 mounting points on the bottom as well as provides 1/4-20 holes on the side for attaching accessories. 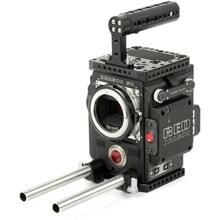 The Riser also brings the camera up to correct lens height when using a Bridgeplate built to RED standards. 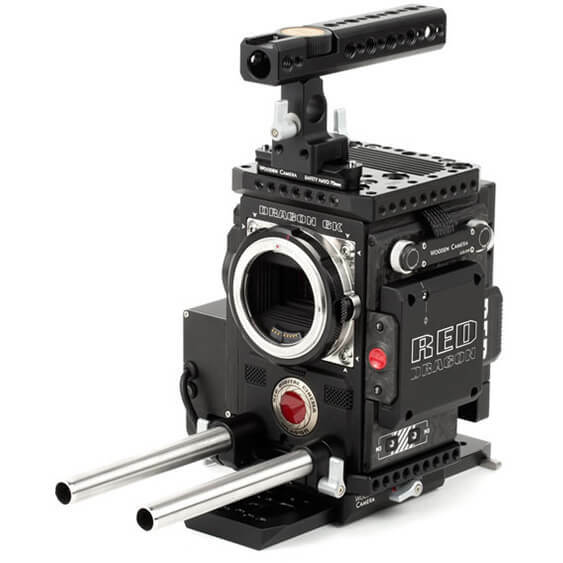 The LW 15mm Bracket attaches to the Easy Riser to hold two 15mm Rods (6") at the correct lens height. 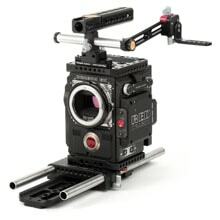 On top of the camera, the Easy Top (Weapon/Epic-W/Scarlet-W/Raven) converts the LCD pogo interfaces to two standard 16 pin LEMO compatible connectors which can be rotated in increments of 45 degrees. Additionally a 3pin Fischer is located on the side of the top plate and can be used with any ARRI standard remote trigger. NATO Handle Kit (Plus, 70mm) is a quick release handle built to NATO standards. Rotating top grip allows the handle to be quickly turned forward for balanced carrying. Side 15mm opening allows the attachment of viewfinder mounts and other accessories. 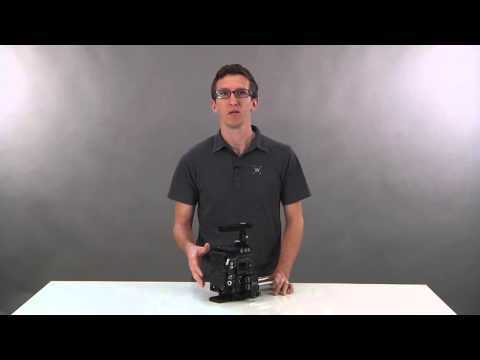 The integrated hot shoe mount on front is great for attaching microphone shock mounts or on camera lights. 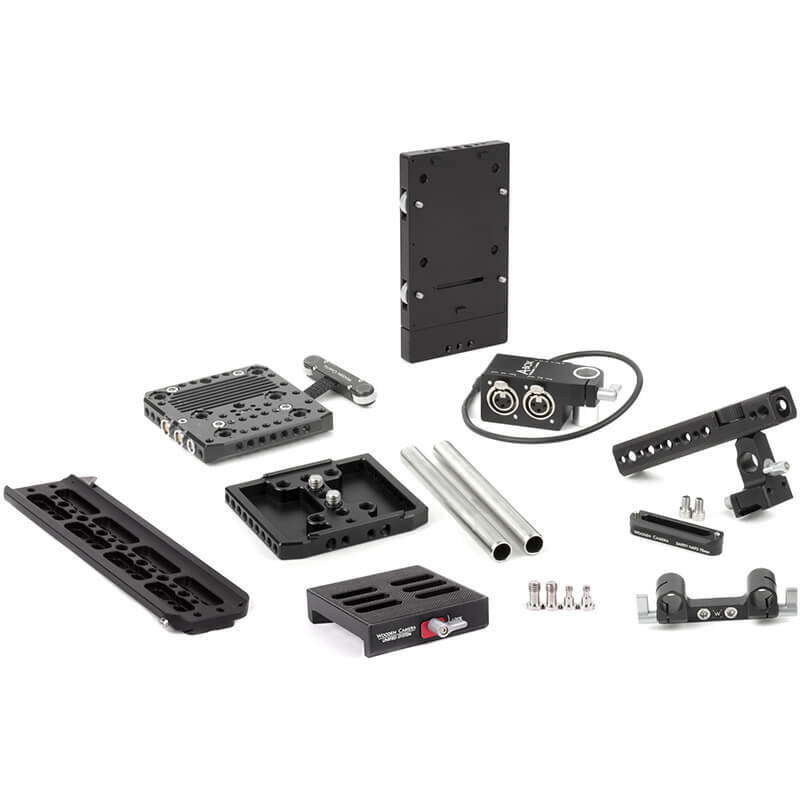 The Dovetail Clamp on the bottom is an ARRI standard dovetail interface that attaches to the included Safety Dovetail (8") to allow for quick install and removal as well as counterbalancing. A-Box (Weapon/Scarlet-W/Raven) allows two XLR microphones to be used and plugs into the RED Base Expander Module. Note that the Base Expander Module is required for the A-Box to function and phantom power is not available. 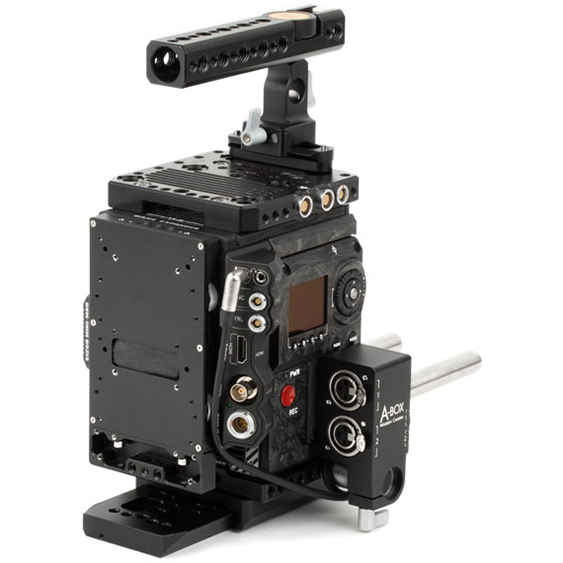 Finally, the Quick Back (Weapon/Epic-W/Scarlet-W/Raven) is included to allow and V-Mount or Gold Mount plate to be attached to the back of the camera. Dimensions: 304.80 x 177.80 x 152.40mm / 12.0 x 7.0 x 6.0"